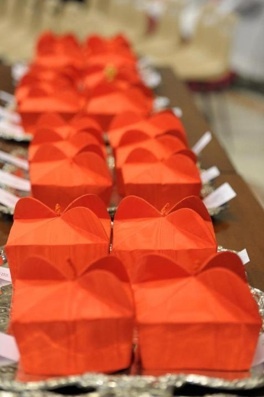 On a Calendar Note, just a reminder that Thanksgiving Weekend won't exactly be quiet on the beat – Saturday morning brings the "mini Consistory" elevating six new cardinals, making 2012 the first calendar year since 1929 to see two separate intakes to the Pope's "Senate." A half-hour later than February's rites, the formal induction ceremony – at which, according to the revised ritual first used earlier this year, the designates will receive both their red hat and redesigned cardinal's ring – begins at 11am Rome time (5am Eastern, 1000GMT) in St Peter's Basilica. The following morning, the new crop's concelebrated Mass with Benedict XVI on the feast of Christ the King is slated for a 9.30 start. As of this writing – in a first for B16's five gatherings of the College – no announcement has been made on what had been the customary day of prayer and consultation with all the cardinals on Consistory Eve. Then again, the confluence of the abbreviated 30-day timetable from the announcement and the smallest group to be elevated since 1977 could just see a lower turnout of the more far-flung members. 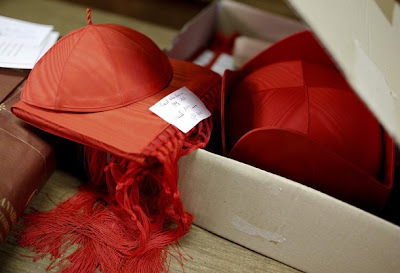 And lastly, with Cardinal-designate James Harvey's impending, already-announced move to the Basilica of St Paul's Outside the Walls and Archbishop Joseph Tobin's recent transfer to Indianapolis, it bears noting that the Holy See's "chief justice," Cardinal Raymond Burke, stands as the lone American prelate in a major Vatican post.... So they say, however, that might not remain the case for long. As ever, we'll see what happens. In the meanwhile, to those among us heading out early for the holiday, every wish for safe travels and a wonderful time – a blessed and Happy Thanksgiving to you and yours.